That Indonesia is the home of sate (satay)? There are over 3 dozens recognized versions of satay in Indonesia, each use different cuts of meats, marinate, and dipping sauce. This national dish can be found anywhere from street vendors to family restaurants to fine-dining establishments. It can be made at home as well, in fact, my mom often made this dish for my family on the weekends when I was growing up in Indonesia. The heart of the dish is seasoned, skewered, and grilled meat - either beef, chicken, goat, mutton, pork, fish, or even tofu - grilled over wood or charcoal fire. It has since spread to neighboring countries like Malaysia, Singapore, Thailand, Brunei, Philippines, and Suriname. I still remember family picnics where my mom would grill satay for us. It was so delicious with the spicy peanut sauce, and the family couldn't have enough of it. This delicious, mouth-watering satay is definitely one that gets everyone fighting for more. That President Obama cited bakso (and nasi goreng) as one of his favorite childhood dishes? He spent a few years during his childhood in Indonesia and during his 2010 visit to Indonesia, he was quoted to say "Bakso, nasi goreng, semuanya enak!" - translation: "Meatball soup, fried rice, everything is delicious!" 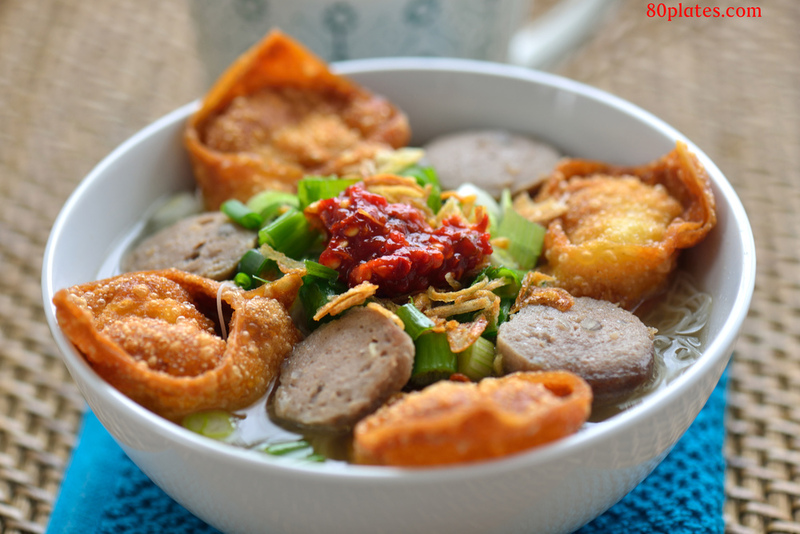 That the President likes bakso so much is no surprise, bakso is a national street food in Indonesia. Often sold in pushcarts or hole-in-the-wall eateries, the dish is popular to students coming home from school, midnight owls coming home from clubs, and just about anyone. There are a lot of variations with different size beef balls and noodle types (wheat, mung bean, etc.). Some argue that it is the quintessential melting pot dish with the beef balls coming from the Dutch (who colonized Indonesia for 3.5 centuries), noodles from China, and condiments from Indonesia Many Asian countries have meatball soups, but experts agree that Indonesia's version of it is one of the very best. Durian is definitely not for everyone? Durian, also known as the king of fruits, has a sweet sticky flesh prized by many and a very potent smell likened to gym socks or rotten onions or both. Yet many people, especially in East and Southeast Asia, love its custardy, almond-like, flavor and texture - it is consider a treat over there. The world consumes ~1.4M tons of this fruit in 1999 and its popularity grows every year. A single durian fruit can easily fetch $50 in certain countries. While it is an acquired taste in other parts of the world, in those regions, durian is used to flavor many desserts - ranging from ice creams, to cakes, to cookies, to pastries - to main entrees like "ikan brengkes" (fish in durian sauce) in Indonesia. Different parts of the durian tree are also used in a variety of dishes in Southeast Asia. My husband, who is part British/Irish and part German, doesn't like durian. In an effort to sway his opinion towards accepting this fruit, I've made it a quest to try different durian recipes for him from time to time. This one is a play of Hong Kong's famous dim sum dessert: the Mango and Cream Pancake. I used ricotta cheese here as it stands up better to durian's sweet custardy texture. Yum! Mee goreng is a flavorful and spicy noodle dish very popular in Indonesia, Malaysia, and Singapore. Sometimes written as 'mie' or 'mi' goreng, the dish can be found literally everywhere in Indonesia, from street hawkers, to hole-in-the-wall shops, to high-end restaurants. It is an Indonesian 1-dish meal favorite, commonly sold together with nasi goreng (fried rice). In Malaysia and Singapore, the dish is commonly sold in mamak stalls. Its origin can be traced back to Chinese chow mein and Japanese yakisoba. However, mee goreng differs from these Asian noodle dishes due to the heavy incorporation of dark (sweet) soy sauce and the use of shrimp (instead of pork). Every province in Indonesia (there are 34 of them) has a variation of this dish, some use goat meat or mutton, some use regional spices only available in that region, and so forth. The version listed here is known in Indonesia as Mie Goreng Jawa - to note its origin (the island of Java). This dish is the perfect cure to carb cravings, simple lunch/dinner, late-night eats, and it has been known to cure hangovers with its spicy, delicious kick! Fried rice is a common comfort food in many Asian countries. It is a versatile dish served everywhere from banquets (weddings included, usually just before desserts) down to hawker centers to food carts. For a dish often made with leftover proteins and vegetables, it is one of the common denominator for rice-eating countries. Each country has its own variation, sometimes multiple in one country. It can be eaten as a course by itself, or to accompany other dishes. In Indonesia, the sight of a street vendor selling nasi goreng from his/her cart is very common, especially in late afternoon/evening. The key to Indonesian fried rice is the incorporation of sambal terasi - a fermented shrimp-chilly sauce that gives nasi goreng a distinct flavor. President Barack Obama has cited that this street food is one of his favorite childhood meal (along with bak so, recipe to come) when he lived in Indonesia. The use of a wok is highly encouraged in cooking this dish. Also, it is crucial that the rice be cooled as freshly cooked rice has moisture that will cause it to steam instead of fry. Instant ramen originated from Japan during the WWII era when Momofuku Ando, its creator, stepped up to feed the war-torn and hungry country with cheap food source. Before he created instant ramen, the noodle was widely eaten in the country already in the form of traditional noodle soup made of Chinese-style egg noodles and chicken/pork broth. Every region in Japan has its version of this beloved dish (not unlike the pasta craze in Italy) and Japanese chefs continue to experiment with ramen even today. Today, through college dorms and households around the world, people consumes about 94 billion packages of instant ramen annually. It is tasty, cheap, and easily quick to prepare. Asian kids love to eat ramen, both cooked and raw (topped with its seasoning, as an afternoon snack much like potato chips). One thing to keep in mind: ramen is high in its sodium content.